Launch of the new 140' IAG Yacht KING BABY! 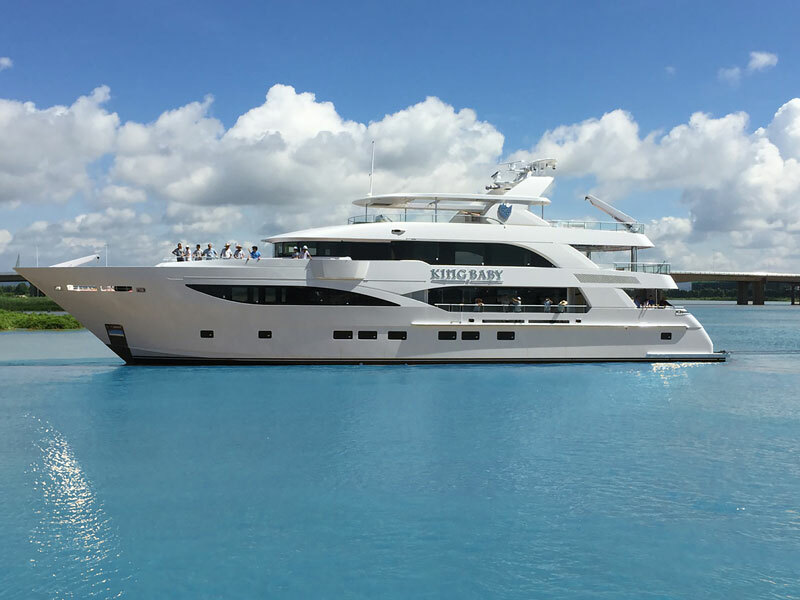 : Atlantic Yacht & Ship, Inc.
Doug Hoogs of IAG and Joe Marino of Atlantic Yacht & Ship are proud to announce the launch of the highly anticipated IAG Noblestar 140’ IAG Tri-Deck Motor Yacht KING BABY. This was a collaborative effort on the part of a talented team of world renowned designers and architects including Evan Marshall, Sergio Cutolo, Tim Kings (Project Manager) as well as significant contributions from Bryan Carter (Build Captain). The 140’ IAG Noblestar is the largest fiberglass composite yacht ever launched in this region of China. Reporters from around the country were present for the launch as fireworks were set off and Chinese ceremonies were performed to ensure safe voyages for “King Baby.” The 140’ IAG tri-deck yacht KING BABY is truly a sight to behold. Her voluminous main deck interior boasts an impressive master suite, well-appointed galley with walk-in refrigerator, dining for 12 and grand saloon. Below deck are four guest staterooms and crew quarters for six, along with laundry room and crew mess, plus the engineer’s cabin aft. The upper deck features a large sky lounge, spacious captain’s cabin, and pilothouse. Exterior spaces are equally impressive. 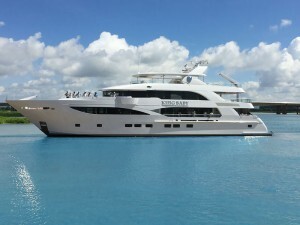 Motor Yacht KING BABY features numerous bars, dining areas and a Jacuzzi with waterfall on the sun deck, shaded by a retractable sunroof. Powered by twin MTU 16V 2000 engines with a combined 5,200 hp, the 140’ IAG can exceed speeds of 18 knots but she also offers transatlantic travel if maintained at an economical speed. Motor Yacht KING BABY is built to RINA and MCA classification, ensuring she meets stringent international standards. IAG matches builders worldwide in terms of quality while surpassing competition in value and price.